Bryan generously sent me four of his creations and they were unlike any other chocolate I’ve tried; Milk Chocolate, Rustic Chocolate, Dark Chocolate and Darker Chocolate were the bars I snacked on last week and snack time has never been the same again! Milk Chocolate: a classic, it’s elevated by a caramel flavor that develops by the combination of the milk powder, vanilla and cacao.To those chocolate snobs that look down on Milk Chocolate, give this bar a try and I promise you will be seduced into a creamy world of milk chocolate that will envelope you and you’ll never want to leave. Rustic Crunch: hints of Vietnamese Cinnamon and crunchy cocoa nibs, make this an adult (and MUCH more refined) “Crunch” bar! Dark Chocolate: perfect to use in a s’more, the Dark Chocolate bar will balance out the sweetness of a marshmallow. 66% cacao is their signature bar. Darker Chocolate: 70% cacao, but the smoothness of this bar develops espresso notes, but a light espresso. Being 70%, I expected slight acid undertones, but Fruition does a wonderful job in creating a smooth darker chocolate. 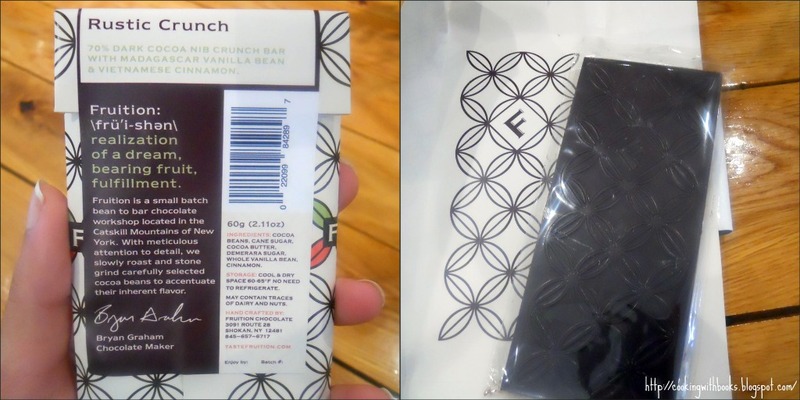 Another aspect I loved about Fruition was the packaging. Isn’t it gorgeous? The bars came wrapped in a rustic twine ribbon and each bar is wrapped in both a gorgeously thick paper printed with their unique design, and the bar itself is sealed in a plastic wrapper to keep it fresh. Even the inside of the wrapper is printed with a continuous design, which gives us an insight to Bryan’s way of doing things: very detail-oriented. Oh and the sticker that seals the bar packaging? Descriptive, informative and personal. Everything you’ve ever wanted in a chocolate bar. 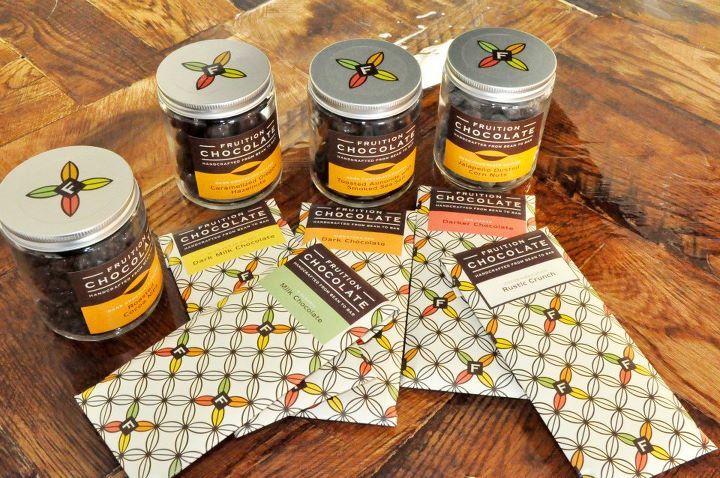 Interested in more Fruition Chocolate? Like them on Facebook, follow them on Twitter, check out their website and view their online shop! 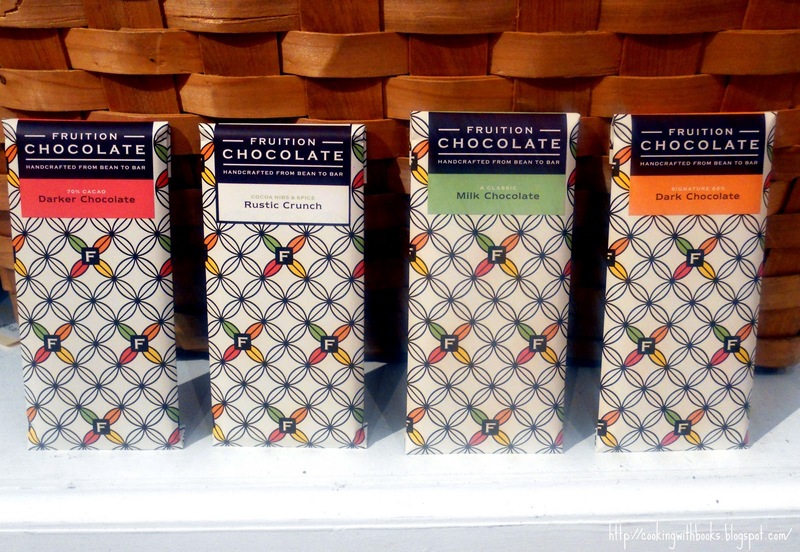 Better yet, if you’re in the New York area in November, stop by the Fruition Chocolate Opening Celebration on November 19th. RSVP on their event page here. Thanks for all the great feedback. Nelly, you’re awesome! Thanks for the kind words about the graphic design and packaging. Their chocolate is inspiring! I want to try the milk chocolate…you had me with caramel! these flavors look delicious! great packaging too! I’d go for the darker chocolate – for me the darker the better! They look delicious! We love a few bites of dark chocolate in the evening. I might have to see about getting some of this brand to give it a try! Hurray! So excited about Fruition. Great that you are covering them. You’re speaking my language! I’ll never love anything the way that I love ‘plain’ milk chocolate (nothing plain about it!). Love the details on the packaging. It’s little touches like this that make products stand head and shoulders above the rest. Chocoholic treat.. learned a lot more about chocolates! You had me at chocolate! They all sound SO good!